To share a document or include an image within a process, the file must be hosted online before it can be accessed through your site. This can be done using the Shared Documents feature within Foundant. Access the shared documents page under tools in the navigation menu. Upload your file using the Add New File button. You may also make this file visible to your internal staff by using the checkboxes but this isn't necessary. Locate where you would like the file to be shared. This is typically within a Form or a Process Description. 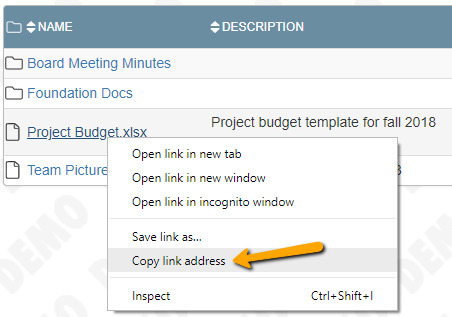 If you are sharing a link to a document you would like users to download, use the insert link button from the text editor bar. If you would like to insert an image into the text, use the insert image button. Once complete you should have a hyperlinked text which downloads the file to the user's computer when clicked or a visible image within your text block.